If you have ever played a harpsichord or a clavichord, you know they feel different from a piano. In a piano, a hammer is thrown at the strings when you press a key on the keyboard. The hammer quickly rebounds so the string can vibrate for as long as you hold the key down (or even longer if you use the damper pedal). The harpsichord is different because the strings are plucked by a plectrum (originally the pointed end of a feather, now made of plastic or other synthetic material). Because the harpsichord plucks the string (as opposed to a hammer striking the string), you are very conscious of the moment the plucking takes place. The clavichord strikes the string with a metal tangent. Unlike the piano’s hammer that rebounds right away, the tangent stays in contact with the string. So the clavichord, too, has its own feel. There was a keyboard instrument called a virginal, which was a small and simple rectangular form of the harpsichord. The spinet was another small harpsichord-type instrument. These are some of the earliest keyboard instruments. Even the fortepiano, the name given to the earliest piano to distinguish it from the modern pianoforte, or piano, has its own feel—the depth of the key fall is shallow and it takes much less weight to press the key down. The piano itself was invented by Bartolommeo Cristofori in Italy in the year 1709. His was a four-octave instrument (compared to our seven-and-a half octave modern instrument), with hammers striking the strings just as they do on a modern piano. The instrument was invented to meet the need to control dynamics by touch, which could not be done on the harpsichord. But the early instrument went through many changes before it emerged as the piano we know today. The Cristofori piano was wing-shaped like our grand pianos, with a curved body and a lid that could be raised. There were also square pianos in which the strings ran from left to right as on the clavichord. And by 1800, there were upright pianos whose strings ran perpendicular to the keyboard. There were many fascinating experiments that produced the giraffe piano, in which the wing-shaped body extended towards the ceiling, or the instrument with six keyboards. A fortepiano built by Johann Andreas Stein had a pedalboard similar to organs. These particular experiments did not lead to the improvement of the piano. But there have been changes to Cristofori’s 1709 instrument. A double-escapement was introduced by Sebastien Erard in 1821; this allowed fast repetition to be made. Using a cast-iron frame instead of a wooden one was important, as it permitted the use of heavier strings whose tension demanded the strength of a metal frame. These thicker strings gave greater volume and brilliance to the piano. Introduced by Alphaeus Babcock in 1830, cross stringing allowed the strings to fan out over a larger section of the soundboard, again giving more resonance and relieving the crowding of the strings. How Much Do You Know About Pedals? On early fortepianos, the knees often manipulated the mechanism we now know as the pedal. For example, you would raise a lever with your knee in order to lift the damper from the string. Can you imagine a piano with five pedals? These existed. Two of the pedals we still have today. The first pedal—the right pedal—is the damper, which releases the dampers from the strings, allowing them to vibrate. The shift, or una corda, pedal is the one on the left that helps change tonal color and play more softly. Then there were other pedals we do not use today: the moderator, bassoon, and harpsichord or Janissary pedals, which created various effects. The third pedal on our contemporary pianos is the sostenuto, invented in 1874. The modern piano acquired its essential characteristics by the 1860s or 1870s. The first piano in America was made by John Brent of Philadelphia in 1774. There have been many piano companies in our country through the years. The piano is an instrument found in all parts of the world. Its large range, which practically encompasses that of a symphony orchestra, its ability to whisper the pianissimos and thunder the fortissimos, and its magnificent literature, make it one of the most beloved, useful and popular of instruments. Dulcimer. This ancestor of the piano originated in Iran shortly after the birth of Christ. It illustrates the basic principles of the piano, hammers striking multiple strings tuned over a flat soundboard. Instead of mechanical hammers, dulcimer players used two light sticks ending with broader blades. Clavichord. First built around 1400, the clavichord was most popular three centuries later in the music of Bach. When a key is pressed, a vertical brass strip (tangent) is lifted toward a pair of strings. The clavichord has a quiet tone, but the way it’s built allows for some control of dynamics and even vibrato. Virginal. The typical virginal is a small harpsichord with keys at right angles to a single set of strings. When a key is pressed, a vertical rod (jack) holding a leather or quill plectrum rises and plucks the string, producing a louder tone than the clavichord but without its dynamic variety. Spinet. Though originating in Italy, the spinet was perfected by English builders in the late seventeen century, about the time of composer Henry Purcell. The jack mechanism plucks the strings just as in the virginal, but the wing shape permits longer strings, increasing the volume and expanding the range to as much as five octaves. Harpsichord. Pictured as early as the fifteenth century, the harpsichord form (where the keys are in line with strings) reached its peak in the period of Bach and Handel. In this shape, the pattern for the modern grand, the strings are longer, and the instrument sounds louder than the clavichord. Cristofori Pianoforte. About 1709, Bartolommeo Cristofori built several instruments in the harpsichord shape but with hammer mechanisms surprisingly like the modern piano action. Because players could control soft and loud (piano-forte), which was impossible on plucked keyboard instruments, Cristofori named his new instrument pianoforte! Piano of Beethoven’s Time. During the eighteenth century, piano builders gradually extended the keyboard. Two important new developments were the escapement action for faster repetition of notes (about 1770 by Stein in Augsburg), and the damper and soft pedals (1783 by Broadwood in London). Upright Piano. The upright design was already in use for harpsichords in the sixteen century. In the eighteenth century, many builders (especially in Germany) tried to apply this form to the pianoforte. In 1800 the first satisfactory uprights were invented. Square Grand Piano. The square piano originated when German builders (especially Johannes Socher in 1742) tried to adapt Cristofori’s pianoforte to the traditional rectangular shape of the clavichord. The square piano was popular until about 1900. Piano of Lincoln’s Time. During the ninteenth century, the piano continued to become more powerful and responsive. The outstanding improvements were the double-repetition action of Sebastien Erard (Paris, 1821) which allowed very rapid repetition; and the full cast-iron frame of Alphaeus Babcock (Boston 1825), the basis for today’s extended keyboard. Modern Grand Piano. The grand piano of today incorporates the best qualities of early keyboard instruments. Cross stringing – a way to achieve greater richness of tone by passing more strings over the center of the soundboard– was invented by Alphaeus Babcock in 1830, but was not used in the grand piano until the second half of the ninteenth century. The sostenuto, or middle, pedal was introduced in the late ninteenth century, permitting greater musical coloring. All pianos have approximately 230 strings. All strings combined are under 18 tons of tension. The cast iron plate that supports the tension is made out of the same material as a church bell. A piano will go out of tune whether it is played or not. The life expectancy of a piano is between 40 and 100 years, depending on it’s manufacturer and environment. Perfect relative humidity for a piano is 42%. There are approximately 16000 parts in a piano. Abraham Lincoln had a Chickering square grand and a Chickering upright in the White House. Teddy Roosevelt had a Chickering upright and a Steinway grand. FDR had a Hardman grand. JKF had an Ivers & Pond grand. Ronald Regan had a Steinway grand. 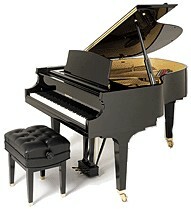 George W. Bush had a 1938 Steinway grand in the foyer of the White House.